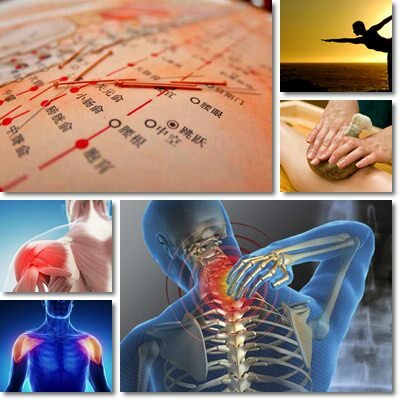 Our muscles contract and relax to ensure and facilitate movement of all sorts. However, when a muscle tightens or shortens, joint stiffness may occur and reduce the normal range of movements of the respective muscle, in which case a muscle contracture occurs. The pain and stiffness sensations that accompany muscle contractures may originate either in the muscle or in the joint that ensures the movement of the respective muscle. Severe muscle contractures can be debilitating. What are muscle contractures? Muscle contractures are not lesions affecting the muscle itself, but rather temporary or permanent deformities that reduce joint flexibility and normal range of movement. But because they affect muscle movement, they are more simply reffered to as muscle contractures. Actually, muscle contractures are a sort of defense mechanism in the sense that they prevent physical overexertion that may lead to permament damage in the form of loss of flexibility and free range of movement of the affected area. Muscle contractures prevent us from pushing too hard and risking serious joint damage and loss of movement. In other words, they are our body’s way of telling us that we have gone too far, worked too hard and strained ourselves too much and we need rest to recover. There are numerous reasons and factors causing and contributing to muscle contractures. What are the causes of muscle contracture? 1) Strenuous physical exercise. Vigorous workout routines that may put too much pressure on certain joints can reduce mobility and lead to muscle contractures. 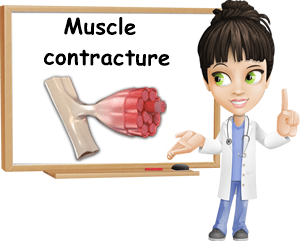 Moreover, abrupt movements or bad exercises also contribute to contractures. 2) Not warming up. Muscle contractures are more likely to occur if we don’t warm up properly before engaging in physical exercise. Inadequate preparation for physical exercise causes the muscles to perceive even a normal amount of strain as greater than it is, pushing joints and muscles to their limits and risking injury. 3) Poor posture. One of the effects of poor posture is muscle contractures. Spending too many hours at the desk, in front of a computer or television will cause us to adopt an incorrect posture and may lead to joint stiffness and muscle contractures. Maintining an incorrect posture during physical exercise can also cause muscle contractures. Working on the laptop in bed is the behaviour that has caused me the worst muscle contractions. 4) Injury. Fractures, burns, nerve injury as a result of trauma or anything that causes our joints to lose their range of movement either partially or completely can lead to contractures. For example, bone fractures, torn ligaments or tendon injury may require putting the affected area in a cast for several weeks. This reduces joint mobility and may lead to contractures. Similarly, more severe burns may prevent a normal range of movement in the joints of the affected areas and engender the same results. 5) Disuse, misuse and immobilization. Disuse refers to any reason, medical or other, that has us not moving freely. Prolonged bed rest, injury that prevents us from using a leg or arm, having a cast, immobilization, sedentarism etc. can, in time, lead to contractures. Misuse refers to not allowing the joints to engage in the full range of movement they are capable of. A knee or elbow injury or a burn near a joint may hurt and have us fearing free movement, a situation that favorizes joint stiffness and muscle contractures. 6) Draft and temperature extremes. Going from hot to cold without being dressed properly, standing in draft can cause a muscle contraction. Actually, catching a draft is one of the most common causes of neck pain and stiffness. Too much airflow, especially cold air, to a certain area of the body can lead to muscles tightening and cause soreness, aches and contractures. Open windows when we are sleeping, air conditioning or a fan blowing straight at us, going outside in the cold without dressing well after being inside where it’s warm, coming out from the shower in the cold should be avoided. 7) Infection or disease. Muscle contractures are common in head injuries, childhood diseases such as polio, birth paralysis due to injury, cerebral palsy, multiple sclerosis, stroke and various nerve, muscle, joint or bone infections, conditions and diseases. However, remember that contractures are not the only symptoms of such severe conditions. What are the symptoms of muscle contracture? 1) Joint and muscle pain and rigidity. 2) Limited range of movements. 4) Limited use of the affected area. Muscle contractures are, by definition, painful. When they occur, we often feel our muscles and joints stiff and every attempt at a normal range of movement is painful. Depending on the severity of the contracture and how we decide to manage it, pain may be mild and allow us to do everything we did before the contracture or severe and prevent us from lifting objects, sitting or sleeping in a certain position, adopting a certain posture for more than a few minutes etc. Pain can go and reoccur or be present throughout the entire time. If we do not manage and treat the condition accordingly from the beginning, the pain can have us resist movemement almost completely, which encourages muscle atrophy, with muscles becoming weaker. Pain can seem localized, as if it comes from a single point somewhere in a muscle or joint or feel as an extensive ache of an entire muscle or joint. The source of the pain may feel like a rigid point in a larger muscle and putting pressure on it in order to better feel it can cause it to become worse. 1) Rest. The first and most important step in dealing with a muscle contracture is resting the affected area so it has time to regain its flexibility. It is important to cease any form of intense physical exercise for two to three days and up to a week (or more, depending on what your doctor may tell you) to avoid the contracture from getting worse. However, resting does not mean becoming immobile or sedentary, just taking it easy. 2) Keep your joints moving. If the contracture is not severe, we can always massage the affected area very gently to keep blood flowing and nerves sensing and move joints in soft motions as much as they allow us to several times a day. Avoid applying too much pressure where it hurts or going past the range of motion your joints permit at the time of the contracture. If the contracture is severe, then physical therapy might be necessary. A trained physiotherapyist can ensure our joints go through their full range of movements safely and stretch muscles encouraging flexibility and supporting recovery. 3) Heat treatment. What has helped me a lot when going through muscle contractures was heat treatment. I take hot showers, wear a scarf on my neck when I go outside and even when I sleep if I have a contracture in my neck, cover the affected muscle and joint and prevent it from feeling cold or use an electric blanket when the affected area feels cold. I have also successfully used an infrared lamp when my contractures were too painful and my movememts extremely limited. 4) Go to your doctor. It is always important to go see your doctor whenever there is something wrong. Your doctor is also the most equipped to recommend the best pain management medication for you if you are, let’s say, allergic to certain medicines or feel you are experiencing too strong side effects to others, adjust your doses, detect a potential infection, diagnose a torn muscle, ruptured tendon etc. Your doctor might recommend various other procedures, from functional electrical stimulation to surgery. 5) Eat right and take your vitamins. Eating right is crucial for every type of recovery because the vitamins, minerals and other types of nutrients we get from our food support healing throughout the body. And because it’s unlikely we get all the nutrients we need from our diets, especially in times like these when our requirements tend to increase, we can rely on quality supplements to supply us with missing amounts of nutrients. Including sufficient protein-rich foods in our diet and eating enough healthy fats can aid muscle recovery greatly. Fresh fruits and vegetables are also important for a balanced diet and overall health. Vitamin C is great for joint health and reducing inflammation, magnesium, calcium and vitamin D are for bones, Omega-3 fatty acids and amino acids help rebuild muscle etc. Overall, preventing muscle contractures is easier than treating them which is why it’s best to learn to avoid the causes that can lead to straining our joints and muscles to such as extent.